Rather than a beach and an ice-cold beer, summer holidays can result in a major headache for small business owners. 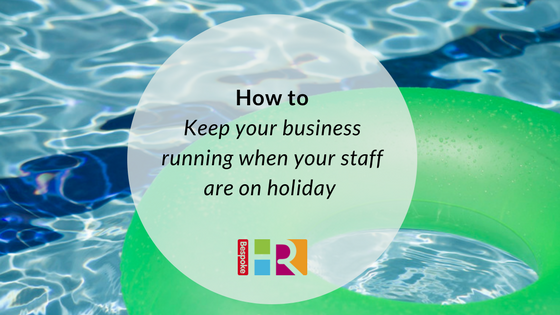 How do you keep your business running during the busiest time of year for staff absence? Use a holiday planner to coordinate your staff holidays. This way you can get an overview of resource before you agree to any leave requests. You can also see which members of the team are needed and ensure the right people are available when you need them. Most HR software systems include a holiday planner which will give you an overview. Plan for emergencies. If you find a key number of staff will be on leave at the same time, make sure you have a clear plan in place should a crisis arise. Ensure everyone is aware of this and consider how it will be communicated. At Bespoke HR, we can access our colleague’s emails so if we needed to find information fast we are able to. Consider flexible and remote working. Some staff may prefer to keep working during the holiday period if they can take advantage of flexible hours or remote working. There are numerous tools available to link a remote workforce such as instant messaging platforms like Slack, DropBox for file sharing, team planning boards like Trello and Skype for telephone calls. Don’t be scared to allow your workforce to operate remotely – if you plan how this will work in advance it could be a breath of fresh air. Brief clients. Make sure your clients are aware that their usual contact will be away, and if there is likely to be a stand-in to avoid any potential issues. Automate tasks. For example, scheduling tools such as Hootsuite and Buffer can help you organise your social media posts in advance so no one need know you’re not actually posting updates live. Tools like FreeAgent can send automated emails to chase up payments so you don’t get behind with cash-flow. Organise handovers. It may sound obvious, but in the last-minute rush before holidays even the littlest things can be forgotten. Make sure all your staff do a proper handover and that you are aware of the status of any live projects or customer orders. Ease staff back in & debrief. Returning to work after the holidays can result in the holiday blues, have a plan in place to hand work back over to your staff which doesn’t leave them feeling overwhelmed. Don’t arrange back to back meetings for their first week back. Take time for yourself. As a small business owner, it may seem impossible to take leave. Surveys have shown that up to 80% of owners forgo a holiday to keep the business running. However, it is imperative you take leave yourself. Not only is it important for your wellbeing, but it can motivate your employees if they are trusted to run the business in your absence.